TruSweets, LLC has recently launched, through its subsidiary Surf Sweets, the Gummy Bear Multi-Pack Snacks. Sour Berry Bears and Gummy Bears multi-pack snack packs are now the newest additions to the company’s candy products. The new product is all made from natural and organic ingredients. These are free from corn syrup, artificial flavorings, artificial food colorings and genetically modified organisms. 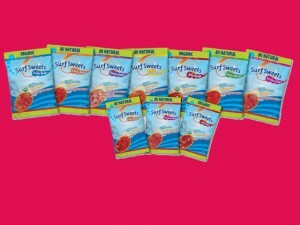 All of Surf Sweets candies, including this new product, are free from gluten. They are also free from casein and dairy. These candies do not contain common food allergens such as wheat, peanuts, egg, fish, tree nuts, soy and shellfish. The Gummy Bear multi-pack snack packs are approved by the Feingold diet and are processed and packed in a nut-free facility. These products are produced and packed in the U.S.
Each pack contains 0.9 ounce of Sour Berry Bears or Gummy Bears. Each case contains six multi-packs and every multi-pack has an equivalent of 90 calories. Aside from Gummy Bears and Sweet Sour Berry, other flavors include Grapefruit, Lemon, Orange, Cherry, Grape and Strawberry. According to Bert Cohen, Founder and President of TruSweets LLC, the company believes that mothers will appreciate that Surf Sweets are candy snacks that are all-natural and wholesome. Their product is also a convenient alternative to those fruit snacks and traditional gummy bear candies. Cohen also added that the new multi-pack snacks not only taste great, they are made from real fruit juices and are fortified with vitamin C, which is a strong anti-oxidant. The new Gummy Bear multi-pack snack packs will have a suggested MSRP of $4.49.